Hod Lipson, Associate Professor, Cornell University, co-author of FABRICATED and the overall Conference Chairman at “Inside 3D Printing” at the Javits Center, NYC, on 3 April 2014. 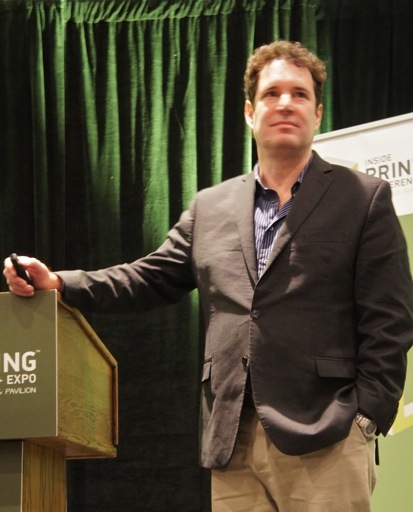 According to Hod Lipson—holding forth as Conference Chairman of “Inside 3D Printing NY ’14″ at NYC’s Javits in early April 2014—3DP-driven healthcare is now the fastest growing segment of all the booming sectors in today’s Additive Manufacturing revolution. And—as I said in our first post in this series [19 May]—HuBod Printing “may have the greatest impact on human well-being AND the cost of delivering that well-being…” 3D Printing will have a totally unexpected upside vis a vis healthcare—AND that impact will extend to the radical reduction in healthcare expenditures at every level. Impacts: Commercial, Social, Legal, Public Policy. 3DP has begun to democratize invention and innovation. America has traditionally been the nation of tinkers turned entrepreneurs (who sometimes graduate to become titans of industry). Think Robert Fulton, Eli Whitney, Samuel F. B. Morse, Thomas Edison, The Wright Brothers, Henry Ford… Our list of amateur inventors—later proclaimed as geniuses based on results—is very long. 3DP—allied with the Internet—presents a completely new paradigm of the possible. Additive Manufacturing/3DP Printing empowers the creative and effective manipulation of atoms. The Internet—pure digits—delivers access to knowledge, resources, connections and markets. This 3DP/Internet “partnership” is democratizing the advance and betterment of healthcare, too. Healthcare in the U.S.—and other countries of the industrialized world—is set apart. Protected, in a word. It is highly regulated by governments, credential-ized by higher-education institutions and affiliation groups and constrained by “gate-keepers” political, social and commercial. Still, 3DP is now helping to disrupt the constricting infrastructure that has traditionally kept healthcare a preserve of a select few—be they professional, organizational or social players. 3DP/Internet democratization has kicked off a kind of “personal manufacturing” (see Chris Anderson’s book “MAKERS, The New Industrial Revolution“). 3DP/Internet “engines”—reviving and supercharging the old American tradition of tinkering in garage or basement—are now delivering up the American “Maker Movement.” The Maker—and Maker Space—is the locus of DIY and DIT (Do-It-Together). The Maker Movement has its own primary driver in Maker Media, Inc. This “media” company covers much more commercial ground than the traditional organization of its kind. Once upon a time (the 90s)—as a tech-marketing maven/consultant—I used to lecture about the business-success uses of the “Trade Tripod.” I defined the Tripod’s three “legs” as (1) Trade Publication, (2) Trade Show and (3) Trade Association. Besides the three-way focus on a single industry (“Trade”), the Tripod was all about The (Multiple-Purpose) List—or the Community (with well-profiled members) that the Tripod served. Few single, stand-alone organizations managed to incorporate all three legs of the Tripod under one roof. Two legs were generally good enough for cross-fertilizing success (most often—in tech—a Trade Publication and a Trade Show). Now, the Internet has both empowered—and diminished—the Tripod concept, structure and uses. For instance, the Internet—with its ubiquitous-connection and communication capability—threatens the traditional functions of the Trade Association. Maker Media, Inc.—eschewing Association structure and function—actually acts like an informal affiliation group. In addition, Maker Media markets and sells products via its Maker Shed. This online and “pop-up” (at Maker Faires) retail organization delivers many of the products that help enable its Maker community. So, you might say Maker Media added a fourth “leg” to the Tripod: that of a retail resource for essential products and components (including educational kits and how-tos) for its industry segment. This Maker Media service is as much about empowerment as it is profit. This entry was posted in Email, HOME, NY3DPWeek, Tools. Bookmark the permalink.